A weekly newspaper’s innovation which transforms printed photographs into videos has been hailed as having the “biggest potential since the introduction of colour” by its editor. 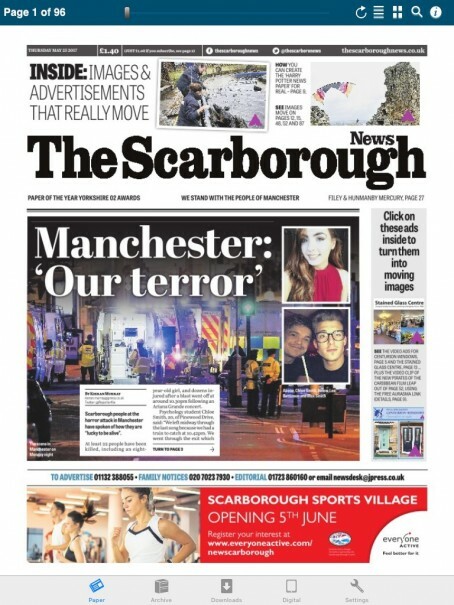 The Scarborough News has introduced technology which enables smartphone users to turn newspaper photos into moving images. Readers can access videos through their copy of the newspaper by downloading an app for their mobile, then hovering the device over certain still images. The innovation has been compared to fictional newspaper ‘The Daily Prophet’, found in the Harry Potter series of books and films, which is read by wizards and features moving images instead of still pictures. The News has developed the idea with technology company Aurasma, which specialises in ‘augmented reality’. The Aurasma app can be downloaded in less than one minute and yesterday’s edition features viewable video on 12 different pages – including some advertisements as well as editorial images. Editor Ed Asquith told HTFP: “We’re hoping it’ll open the possibility of creating a dynamic new partnership between print and digital. When you show people how it works, it’s so simple and goes straight from paper to phone. “It is a really Harry Potter-style thing with images coming out to real life, in reality. Its introduction in the News’ current edition coincides with a conference, called ‘Exploring Digital Futures’, which is being held in Scarborough this weekend and is backed by the Johnston Press-owned News. Ahead of the conference, Aurasma approached Graham Walker, who is commercial content editor for JP in Yorkshire, about the possibility of using the technology in the paper. Said Graham: “We are proud to have created another Johnston Press first – showing how we are using new state-of-the-art innovation to marry print with digital, giving extra added value to our printed products. “We have made the ‘Harry Potter newspapers’ where print appeared to come alive, a reality. A six step guide on how to use it has featured in recent editions, ahead of yesterday’s launch. However, it is yet to be decided whether its use will be expanded to other titles across the group. A similar use of augmented reality technology was made last year by the Newbury News, whose ‘Newbury 13D app’ also enabled readers to bring printed images to life by scanning the page with their phone. The News won the printed innovation of the year award at last year’s newsawards for the ground-breaking app. I think I first saw this messed around with in local papers in about 2012. What are you going to astound us with next? Magic eye puzzles? So, let me get this straight. I have to buy the paper, then download an app, then use my phone to get these extra digital enhancements? If you remove messaging apps like Facebook, Twitter etc from the equation, the average app retention rate after about a year is around 11 per cent. That means when people upgrade their phones or are looking for more space, they delete almost nine out of ten apps they’ve downloaded. Forgive me, but this sounds like something I’d download once, use a couple of times for novelty value and get rid further down the line. Taking into account the cost of creating and maintaining it and the continual cost of marketing it to a dwindling newspaper audience, this really doesn’t sound like its going be pulling up any trees in terms of boosting the bottom line. This is a gimmick and a complete waste of time. Why are people still fiddling with this kind of nonsense when resources are tight and there are so many more important things that need doing? wouldnt it be much easier to just leave nclude a website address in the paper or advert other than this long winded novelty route to see a moving image? Presumably the production tewuired to get the ads to move is provided free? If not who really is go No to pay to have this pointless extra added? And using this app..the revenue created is??? Tried this six years ago. Come back in six months when you’ve got the number of readers who’ve downloaded the app. It won’t make three figures, and maybe not even two. Even after a year or two sponsoring Tottenham, Aurasma made no impact at all. The Princess Leia hologram was 40 years ago!!!!!!!!!! Johnston Press are sheer magic! They’ve turned so many good newspapers into pure rubbish. It can’t have been easy!